If you have ever taken children to an illusion museum you will know about infinity mirrors. Look into one and the lights around the edge appear to head to infinity. It gives you a sense that the path to the future is both clearly defined and well lit. This is what stock markets feel like in periods of intensely loose monetary policy. When money is constantly cheap and available everything seems straightforward. Markets go up whatever happens, leaving investors free to tell any story they like about why. It is easy to believe that tech companies with profits in the low millions are worth many billions. Or, as one fund manager told me last month, that traditional equity valuation methods are no longer the point — all we need to think about before we invest these days is how the company in question can respond to digitalisation. You can believe that the Philips Curve is genuinely dead: that labour will never regain the power to really make a difference to real wages. Or that, even if it did, workers are becoming such a tiny part of the corporate cost base that it simply doesn’t matter to profit margins. And you can believe that global companies will never be subject to the tax or regulatory whims of sovereign governments; that this time everything is different. It is all an illusion of course. Turn the power off at the museum and the bright lights of a comprehensible kind of infinity disappear. Turn off the liquidity taps at the world’s central banks and so does the ability of the market to believe seven impossible things before breakfast. That is why nearly all equity markets have had a horrible month. Almost all indexes are down — by as much as 14 per cent over the last four weeks, and 24 per cent on the year. The only major markets in positive territory over a year are those in the US and Russia. The surprising thing here is not so much that markets have tanked, but that, given that they are supposed to be discounting mechanisms, taking in and reacting rationally to all available information, it didn’t happen sooner. US monetary tightening has not exactly been kept under wraps. The dual approach of cutting its asset holdings while hiking rates has been well advertised. The Chinese government’s intention to attempt to deleverage has been no secret either. Nor has the tapering of quantitative easing in Japan or the intention of the European Central Bank to pull back from it completely. The ECB’s asset purchases fell from €60bn a month in 2017, to €30bn in January, 2018. Its president, Mario Draghi, expects them to halve again in this quarter, with a view to ending them completely by the end of year. All this tapering and hiking might or might not be a good idea — not everyone would necessarily want to tighten monetary policy in Europe at a time when the Germany economy is looking iffy and Italy is attempting to assert its fiscal sovereignty. Whatever you think of it, there is no doubt that the liquidity lights, if not already off, have been dimming for some time. Suddenly what matters is not how much money is being printed, or when and where, but where we find ourselves in reality. In the case of stock markets, that means politics starts to matter again — but, in the main, it means investors have to start focusing properly on cash and valuations. October shouldn’t be seen as the end of the bull market (look at the annualised performance numbers for most markets and you will see that it ended some time ago). But this month can be recognised as the point at which the market shifts from being driven by liquidity to being driven by fundamentals. For those badly positioned going into such a change (less thoughtful growth investors perhaps) this is nasty. For the rest of us it is good news, twice over. First, some of the things fund managers believed a few months ago could well be true in part. US corporate profits look fine. Around 40 per cent of S&P 500 companies have reported in this earnings season and some 80 per cent of them have managed to produce a positive surprise. Second, stock markets outside the US really are not that expensive any more and pockets of them are beginning to look like they offer some value. That should please long-term investors. It should also be absolutely thrilling to the active investment industry. This sort of shadowy environment is exactly the kind in which they can have another go at proving their special stockpicking skills are worth paying for. The budget standoff between Italy's anti-establishment government and the European Commission has rattled markets and brought back memories of the eurozone sovereign debt crisis. EU officials should remain open to unconventional economic-policy approaches, and the Italians should show that they are serious about long-term reforms. PARIS – Global markets, policymakers, and risk managers are watching the budget skirmish between Italy’s government and the European Commission closely. The episode highlights a growing tendency among governments in both advanced and emerging economies to question economic policy orthodoxy. As this trend intensifies, economists and market participants need to think harder about, and communicate much better, the implicit tradeoffs of conventional economic and financial policymaking under challenging circumstances. 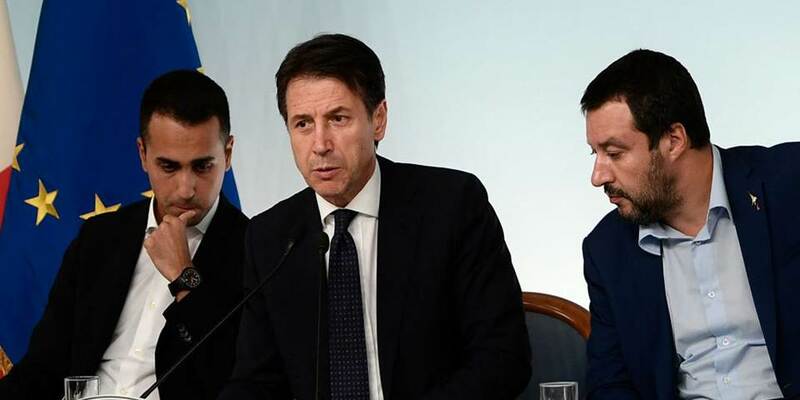 Having been elected with a mandate to promote faster, more inclusive growth, the Italian authorities are pursuing a more expansionary fiscal stance. Their budget, however, has been “rejected” by the European Commission for its “non-compliance” with EU deficit rules. As a result, Moody’s has since downgraded Italy’s sovereign credit rating to just one notch above junk level, citing worries about the country’s debt stock and the government’s overoptimistic growth projections. With Italy’s leaders insisting that they have “no Plan B,” spreads on Italian government debt have risen back to levels not seen since the dark days of euro crisis. And as both public- and private-sector borrowing costs increase, some observers are starting to worry about the implications for the Italian financial system. In fact, some have even gone as far as to argue that Italy poses an existential threat to the eurozone. Others, however, dismiss this as dangerous hype, given that Italy still has a manageable short-term debt-servicing profile, a primary budget surplus and a current-account surplus, as well as considerable economic potential. Italy’s longstanding growth challenge is being amplified by Europe’s recent loss of economic momentum, regional fragmentation pressures, and the gradual reduction in liquidity injections by the European Central Bank. To counter these factors, Italy is resorting to fiscal policy to try to stimulate growth through both demand and supply channels. In other words, the government wants to run a larger budget deficit now in order to generate higher actual growth and higher potential growth. Meanwhile, the pressure on Italian risk spreads has been accentuated by a shift in global markets. The past several years have been characterized by unusually low market volatility and an appetite for higher risk, owing to ample, repeated, and predictable liquidity injections from central banks. But markets are now moving toward greater risk aversion and higher volatility as monetary policies tighten and as growth – particularly in advanced economies outside the US – slows and becomes more divergent. Looking ahead, much will depend on whether Italy’s big policy bet can be reconciled with the rules and guidance of the European Commission. But make no mistake: global factors will also play a role, not least by determining how much time Italy and the Commission will have to sort out their differences. Precisely how regional and international factors evolve will have important implications for Italian sovereign spreads. An orderly policy transition would provide breathing space for the government’s economic strategy to evolve, whereas an abrupt shift would create significant headwinds in the form of tightening financing conditions for the Italian government and private sector. This is not the first time that a newly elected government has challenged economic orthodoxy in the advanced world (the phenomenon is usually associated more with emerging economies). Upon taking office in January 2015, Greece’s Syriza government signaled its departure from the conventional approach adopted by its predecessors, even going back to the electorate for re-affirmation in a nationwide referendum. In the end, though, the threat of losing eurozone membership forced it back to policy orthodoxy. In the United States, the Trump administration and congressional Republicans pushed through a late-cycle fiscal stimulus, cutting taxes and raising government spending at a time when the US economy is already growing rapidly due to higher consumption and business investment. Normally in an aging expansion, the government looks for ways to increase its policy flexibility as preparation for a possible future downturn. But, here, pro-cyclical policies were accompanied by a more confrontational approach to trade. Needless to say, this, too, runs counter to economic orthodoxy which regards trade as mutually beneficial, and protectionism as unnecessarily costly. Likewise, Turkey has been busy rewriting the rules of crisis management. So far, at least, President Recep Tayyip Erdoğan’s government has managed to overcome a currency crisis without aggressively raising interest rates or seeking financial support from the International Monetary Fund. These unorthodox policy approaches are fundamentally challenging the conventional wisdom on how economic policies should be sequenced. For example, both Italy and Turkey have dispensed with the dictum that macroeconomic stability must come before growth-promoting fiscal and monetary stimulus. Or, as the old saying goes: Macroeconomic stability isn’t everything; but without it, there is nothing. The increasing appeal of unorthodox policy approaches is the direct result of years of slow and insufficiently inclusive growth, coupled with mounting concerns about the inequality trifecta (income, wealth, and opportunities). These factors have undercut advanced economies’ actual and future potential, alienated significant segments of the population, eroded the credibility of the establishment and expert opinion, and fueled the politics of anger. Rather than dismiss the reaction out of hand, experts should be more open-minded when grappling with the factors behind the new unorthodoxy. Specifically, the tradeoffs that are implicit in conventional approaches need to be carefully quantified and clearly communicated. And those approaches should be updated for a world in which anemic growth seems to have become a structural feature of a growing segment of economies. In a world of self-reinforcing expectations and multiple equilibria, careful efforts to jump-start economies might facilitate the success of more durable structural reforms. In the case of Italy, then, the EU should remain flexible. But the Italian government must also demonstrate that it is a lot more serious about implementing the supply-side changes needed to sustain faster growth in the long term. LEE SHAU KEE moved to Hong Kong from mainland China in 1948, the year before China’s Communist Party seized control. In 1976 he set up a property company, Henderson Land Development, which helped to develop the tallest building on Hong Kong island and the hotel where Edward Snowden spilled America’s national-security secrets. 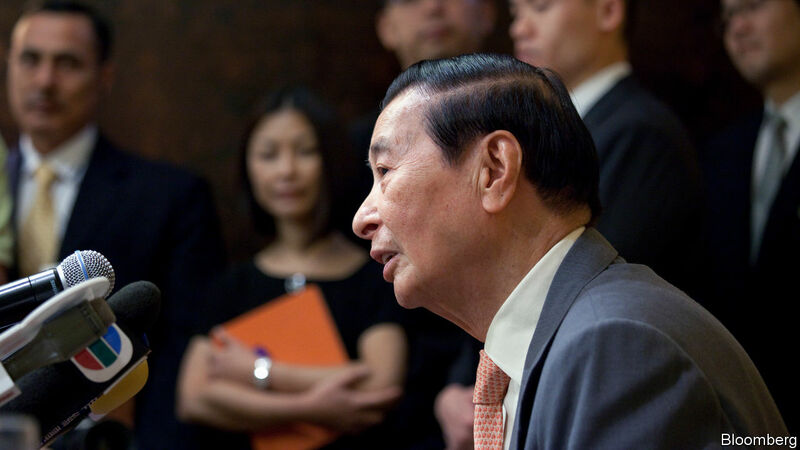 Mr Lee is now the world’s 27th-richest person, according to Forbes, a business magazine. He and the 26 richer individuals have a combined worth of $1.39trn—more than the entire wealth of the poorest half of humanity. This kind of startling comparison between the world’s most and least pecunious has been popularised by Oxfam, a charity. It draws on Forbes’s regular rankings of the world’s billionaires and the Credit Suisse Research Institute’s annual reports on household wealth. But the precision implied by such comparisons is spurious. The data on global wealth (which includes the net financial assets and property holdings of individuals) are too spotty to be rounded off to the nearest billionaire. 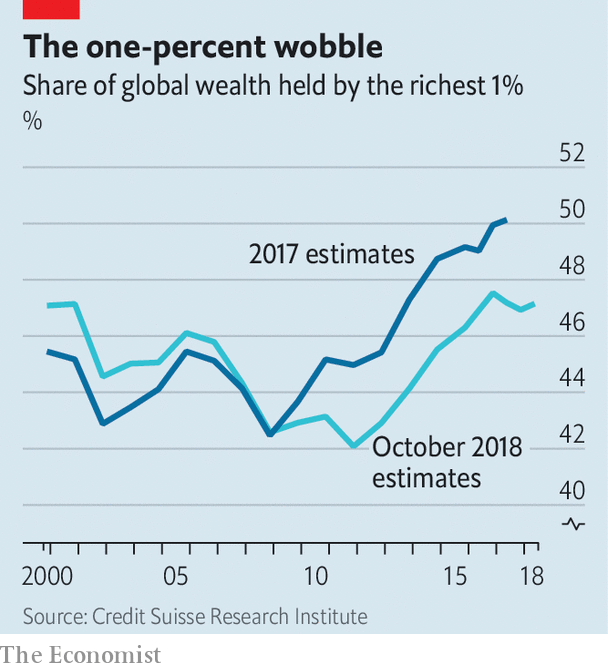 Tony Shorrocks, the lead author of the Credit Suisse report, is reasonably confident that the poorest half of the world owns less than 1% of its wealth. But it is hard to be more exact than that. The measurements are, however, improving. In last year’s Credit Suisse report, the richest 1% seemed to claim more than half of the world’s wealth (see chart). But new and improved estimates suggest the share of the one-percenters may have peaked or levelled off. Between 2016 and 2018, it fell in Brazil, Britain, France, Germany, India and Russia and flattened off in America, Canada, China, Italy and Japan. To be a member of the 1%, a person now needs over $870,000 in net assets. Two-fifths of this happy bunch can be found in America. In the past, the second-biggest contingent was always in Japan. But this year they live in China, home to 8.4% of them (and Hong Kong adds another 0.4%). This rapid accumulation of wealth is testimony to the industry and ambition of people like Mr Lee. Back in the 1970s, he gave his new company a sensible Scottish name, presumably because of the Scots’ admirable reputation for stewarding wealth. But China now has more than 1m more millionaires than the whole of Britain. As Ludwig von Mises correctly stated, in a free state, no one is forced to remain within the state. Anyone who seeks to emigrate is free to do so. This is, in fact, one of the primary tenets of liberty – if you don’t like it, you can leave. And so, it follows that, if the right to exit is curtailed in any way, the state has ceased to be free. There are those, including myself, who feel that, once this line has been crossed by a state, it’s time to skedaddle. Don’t wait for conditions to “get better.” They won’t. History shows us that, in every case where migration has become curtailed, the state never reverses to a more open policy; in fact, it becomes decidedly more restrictive. We’re presently living in a period in which most of the countries that were formerly the most free, half a century ago, have declined considerably and many are approaching a state of totalitarianism. Readers of this publication will be familiar with my forecasts that the principle countries that are at the forefront of this decline will be steadily increasing both their capital controls and their migration controls. With regard to the latter concern, the emphasis will not be on keeping non-productive people out, it will be on keeping productive people in. Please read that last line again, as it’s very telling. As the reader will be aware, the EU and US are rife with problems regarding large numbers of people immigrating from other countries. The respective governments do all that they can to encourage this immigration, including providing immigrants with rights and benefits that are not accorded to the tax-paying citizens of those jurisdictions. All the more reason, then, that an eyebrow should be raised when these jurisdictions make it more difficult for their own citizens to travel within or exit the jurisdiction. The US, for example, now has a 100 mile zone along all its borders, where checkpoints are set up to control the movements of those who pass through them. Citizens are routinely asked intrusive questions that they are not lawfully obligated to answer, yet, if they don’t, they may have their car windows smashed, be tased, apprehended and subjected to search and detainment. As can be seen in this video, https://youtu.be/wnicMKKSReY, the policies set nine years or more ago for the patrols bear a striking resemblance to those of the Nazi Brownshirts of the late 1930’s and early 1940’s. Of course, it’s quite true that Americans are presently able to fly out of the country, as long as they have a valid passport and submit to a search, so, does this not suggest that it’s paranoia to think that the ever-expanding number of “border” inspections occurring 100 miles within US boundaries has any purpose other than to detain illegals? Well, there is that niggling problem that the US government goes way out of its way to allow illegals to enter, then provides them with welfare, education, housing, healthcare and other encouragements. In addition, an illegal is far more likely to be released than an American citizen if he commits a crime, even if that crime is murder. Clearly, the segment of the population that’s being indoctrinated to believe that they no longer have the right to move freely are American citizens themselves. Well, a simple answer is that, historically, whenever a state has created an economic and/or political time bomb that’s set to go off in the not-too-distant future, that state has instituted migration controls to assure that its most productive members do not leave. This can be seen throughout history and is presently most visible in Venezuela, whose porous borders have allowed over 2.3 million people to escape to neighbouring Colombia, Brazil and Ecuador in recent years. The state has ramped up its border controls in order to stem this flow, but has found that merely guarding the border is not sufficient. A buffer zone is additionally necessary – one where anyone travelling is suspected of attempting to exit. And, again, this is nothing new. Buffer zones and “no man’s lands” have existed throughout history. At present, the US practice of shaking down those in vehicles is merely a nuisance – the removal of the “inalienable right” to liberty on a temporary basis. However, it does not bode well for the future. If the only reasonable explanation for these inland checkpoints – some of which are placed in small towns where everybody knows each other – is to get citizens accustomed to the concept that they do not have the right to liberty, it’s a necessary step to achieve, if the intent exists to one day curtail migration by US citizens. Such zones would then be quite effective, not just in discouraging anyone living in the 100-mile zone, but in discouraging any American citizen. If, for example, someone living in Nebraska decided to exit a deteriorating US, he’d know that he’d be unlikely to penetrate a 100-mile zone that included innumerable checkpoints. Those who use airports to travel in and out of the US are already familiar with the fact that they are not to refuse authorities in any way whatsoever. Those few who create a fuss are often escorted to the back room. Their fate, whether it be good or bad, is never learned by other travelers, but the message is clear – comply with everything. Returning to Mises, in a free state, no one is forced to remain within the state. Anyone who seeks to emigrate is free to do so. For those who recognize that the US is no longer a free country, as it once was, the question arises: Do I accept that my liberty has been removed by my government? Do I wait, in the vain hope that a state that’s moving headlong into totalitarianism will somehow magically reverse itself and reinstate my liberty? Or do I choose to make an exit now, while the window of opportunity still exists and migrate to one of the countries where liberty is still very much alive? But, again looking at history, the latter decision has been uncommon in the extreme. From Rome in the fourth century, to Nazi Germany in the 20th century, history shows that very few people take action while there’s still time. The great majority wait until the migration restrictions have been implemented, then attempt to leave, usually unsuccessfully. In the ramping-up of any totalitarian police state, one of the warnings that conditions are going to become more draconian in the near future is that the state first secures the borders. That warning is as invaluable as it is prophetic.